Selective Rack (Standard) – Canadian Rack Inc. Selective Pallet Racking is the most commonly found pallet rack system in warehouse storage facilities today. Selective or standard pallet racks provide easy product inventory management and direct access to pallets. Selective Pallet Racking Systems are a cost-effective storage solution. 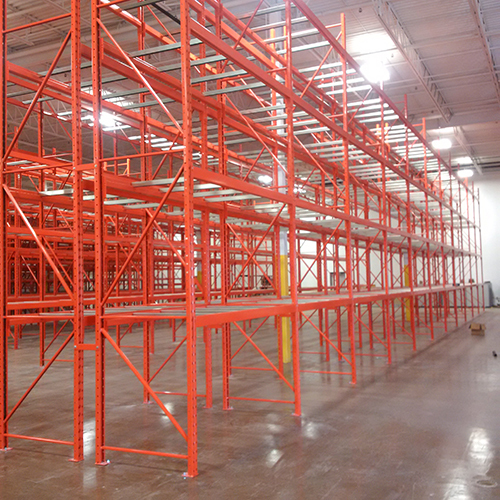 Selective pallet racking is constructed with uprights and beams. Added safety features include wire mesh decks and safety cross bars. This type of system provides incomparable protection against damage, tampering or accidental disconnection. Selective rack is available in two styles, roll formed steel and structural steel. Roll formed is the most commonly used style for most warehouses and distribution centers, as it is least expensive, and most of the time, meets weight capacity needs. Roll formed also comes in a Bolted configuration, whereby the braces (ties, diagonals and braces are bolted together. Expand your warehouse with ease using this type of pallet storage equipment. Our pallet racks are designed and manufactured with one thing in mind, make every inch of warehouse space count. We do not waste space, material, and time.